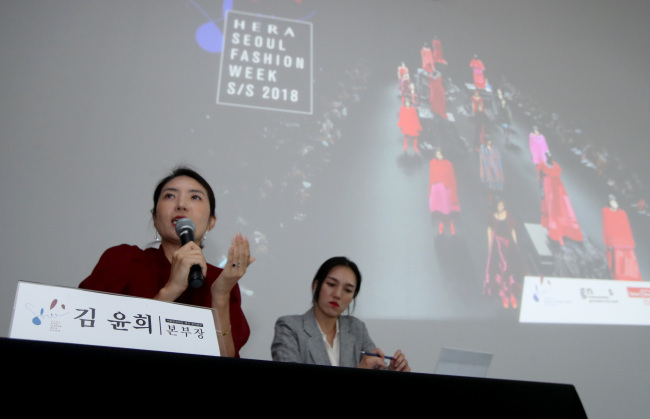 The upcoming 2018 S/S HERA Seoul Fashion Week will focus on increasing support for emerging designers, inviting more quality buyers and creating a festive mood throughout the city. “More companies are interested in backing new artists. This is inspirational, and we aim to follow the trend,” said Kim Yoon-hee, the director of fashion and creative industry division at Seoul Design Foundation at the press conference held Tuesday at the Dongdaemun Design Plaza in Seoul. Noticeably absent at the press conference was Jung Ku-ho, the executive director of Seoul Fashion Week, who has been in charge of the Seoul Fashion Week for three years. His term was extended for another year but the director is said to have expressed a wish to take time to consider his next move following this season’s presentation. Opening the doors to international stages for Korea‘s budding designers is one of the aims of the Seoul Fashion Week and the organizers have sought to boost the number of international buyers with purchasing power coming to the event. “We have invited 30 additional buyers this year, bringing the number of those invited to 170. Altogether, some 300 to 400 buyers are anticipated at his year’s fashion week,” said Kim. Leah Kim, the womenswear executive vice president of Barneys New York; Jeannie Lee, the Selfridges women‘s designwear buying manager and Ha Joo-hyun, a womenswear buyer at the Excelsior Milano are among those who will be on the lookout for talent. The Generation Next Seoul section of the week will highlight up-and-coming designers selected by the Fashion Week organizers. Apart from the runway shows, there will 18 off-show fashion events throughout the city, fashion movie nights and parties at the DDP. The veteran model-turned-designer Rubina will be honored during the fashion week with “Endless Journey,” an exhibition featuring works from her 37-year career. The 2018 S/S HERA Seoul Fashion Week will take place for six days from Oct. 16 to 21 at the Dongdaemun Design Plaza in Seoul. A total of 41 collections by the nation’s top 35 designer brands and six fashion companies will be presented. The Generation Next Seoul, Oct. 17 to 21, will stay close to the main fashion week venue this season, taking place at the vast underground parking lot of DDP. The section will host a trade show and 16 mini-fashion shows for some 100 young designers. A mentoring seminar titled “FASHION in the Age of Genderless” will be held from 2:30 p.m. to 4 p.m on Oct. 20, where overseas fashion designers will share their views on gender fluid fashion. This year, the Seoul Metropolitan Government has allotted 2.6 billion won ($2.3 million) for the fall/autumn and spring/summer Seoul Fashion Week, down from last year’s 2.8 billion won.